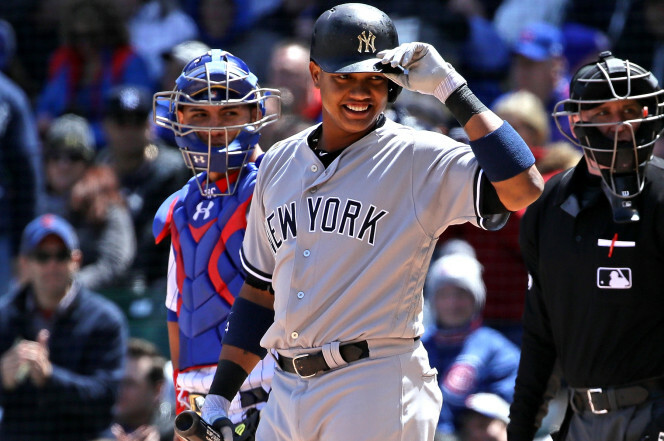 It is frustrating when the Yankees lose games they should have won so there was satisfaction with Friday afternoon’s stunning victory over the Chicago Cubs, 3-2, thanks to a ninth inning two-out, two-strike three-run home run by Brett Gardner. The Yankees had their chances early in the game, but seemed to self-sabotage every attempt to push runs across the plate. The Yankees were fortunate that Cubs closer Wade Davis was unavailable after pitching in the three preceding games for the Northsiders. Davis is currently 2-0 with an 0.00 ERA in 13 1/3 innings. He has 15 strikeouts and has only given up four hits and walks. His WHIP is a paltry 0.60. I’ve read a few Chicago articles that think the Cubs upgraded the closing position with the addition of Wade Davis (a bit of a slam against Yankees closer Aroldis Chapman). But with Davis unavailable, the Cubs were forced to turn to former closer, Hector Rondon, who had been displaced last July when Chapman arrived. Honestly, it didn’t feel like Gardner was going to emerge from the day victorious. After he reached two strikes, he fouled off a couple of Rondon pitches to stay alive. It felt like Rondon just needed to put one in the outside corner to earn his first save of the season. Instead, he left the pitch in the exact spot that he shouldn’t have…low and inside. That’s all Gardner needed to deposit the pitch in the outfield bleachers. The Gardner home run put the game in the hands of former Cubs closer Aroldis Chapman. It wasn’t pretty when the first batter, Cubs shortstop Addison Russell, reached second base as a result of a Chase Headley error. With the game-tying run on second and no outs, Chapman retired the next three batters which included a swinging third strike by Cubs powerful second baseman Javier Baez to end the game. Hats off to Michael Pineda. I know that he gave up two home runs, but he could’ve folded like a cheap suit as he has in years past. He held the Cubs to only two runs on the solo homers and only three hits overall in six innings of work. He struck out six and walked only one. It was a quality start and there’s no way the Yankees could have staged the improbable comeback if not for Pineda’s efforts. The win moved the Yankees to 18-9. They precariously remain in sole possession of first place in the AL East by a half-game over the Baltimore Orioles. The Orioles beat the Chicago White Sox 4-2 despite starting pitcher Wade Miley being hit by successive line drives 12 pitches into the game that forced his departure. 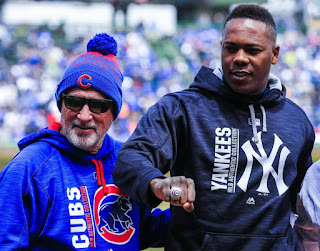 Aroldis Chapman received his World Series ring prior to the start of the game. It was good to see him receive recognition for his contributions for helping to bring the first World Series championship to Chicago for the Cubs in 108 years. People tend to remember the game-tying home run that a weary Chapman gave up in Game 7 but the Cubs would not have been in the World Series if not for #54. Adam Warren also received his World Series ring as a member of the 2016 Cubs, but he chose a private ceremony (he wanted the spotlight on the Yankees closer since Chapman was part of the post-season team that won the World Series plus he didn't feel right wearing Yankees gear with a Cubs ring...'Attaboy, Adam!). It was also a fun day for former Cubs shortstop/second baseman Starlin Castro. He received a standing ovation as the Cubs played his walk-up music when he came up to bat for the first time. There’s no doubt it was an emotional day for Castro who remains appreciative of the Cubs for giving him his first opportunity in Major League Baseball. Gary Sanchez was activated before the game and went 0-for-4 with a strikeout. Kyle Higashioka was optioned to Triple-A Scranton/WilkesBarre after failing to record in a hit in 18 at-bats. I had really been hoping that he could have gotten that first one out of the way before heading back to Eastern Pennsylvania. Have a great Saturday! Sounds like it may be a cold, windy night in Chicago. 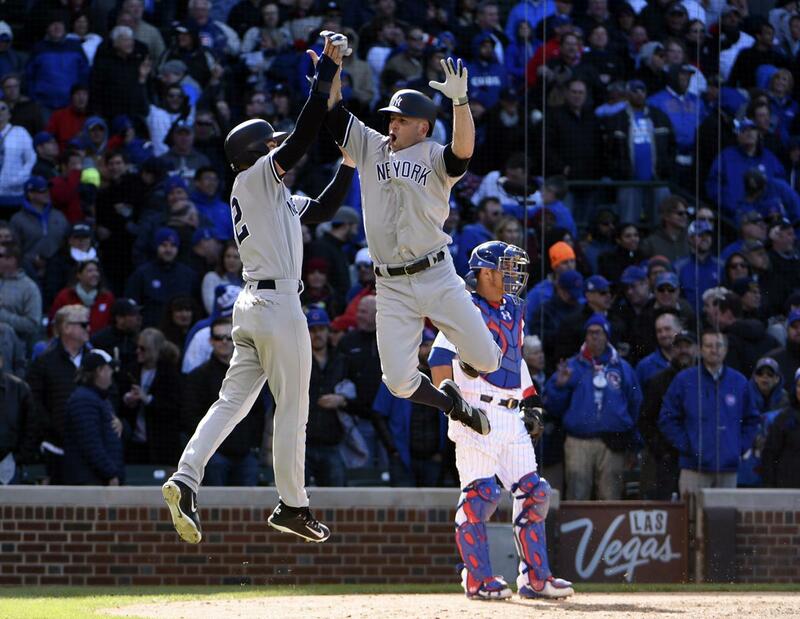 Hopefully it will be a memorable evening for the Baby Bombers in the Windy City.